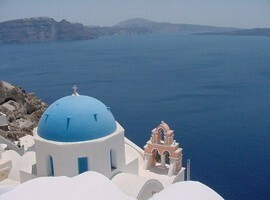 The island of Santorini or Thira belongs to the Cyclades. 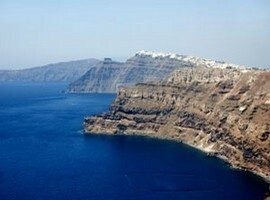 Located 128 nautical miles from Piraeus and it occupies 75.8 square miles. 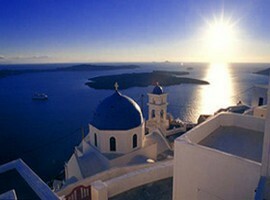 It is famous for its volcano which is the youngest volcano in Greece and the most active in Europe. 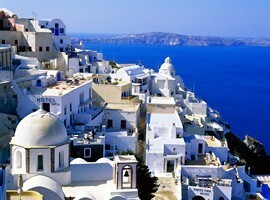 Santorini is one of the great natural wonders of the world, the most fascinating landscapes in the world. Its landscape is the result of a massive volcanic eruption that happened probably around 1630 BC. 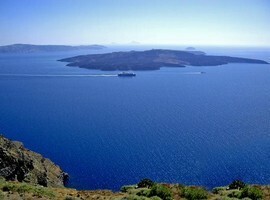 The island has become one of the most popular holiday destinations worldwide, because of volcanic wild beauty and breathtaking sunsets from the top of the caldera, a pole of attraction for Greek and international celebrities. 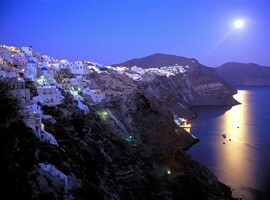 The old port of Santorini lies below Fira town. In the past, the ascent was only possible by donkey or on foot by the stairs. Today there is tarmac that leads to Fira and the impressive cable car and donkeys have become an alternative graphical way uphill for tourists. 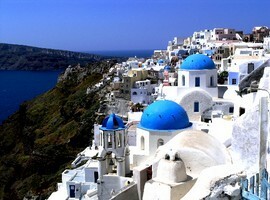 At the port there are buses and taxis to take you to Fira, Oia and elsewhere. 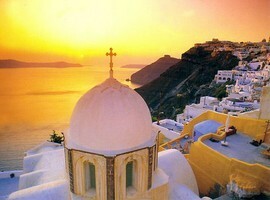 Fira is the capital of the island built with a mixture of Venetian and Cycladic architecture. There are cobblestone streets with all sorts of shops, restaurants, cafes. 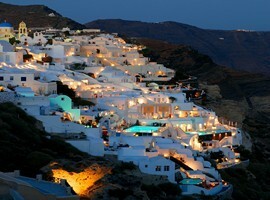 The tourist infrastructure is among the best in the Greek islands. The most important part of the city lies between the Red Cross Street, which has most of the nightlife and Ipapantis Street, where you will find many upscale restaurants and hotels. In the town there is a museum and many beautiful churches with the Cathedral being one of the most beautiful. 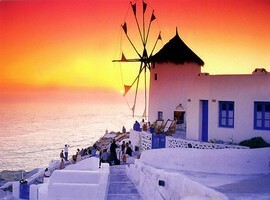 One kilometer north of Fira there is another popular village of Santorini, Imerovigli which is quieter than Fira and is an ideal place to stay with the same beautiful view and it is close enough to go to Fira on foot. 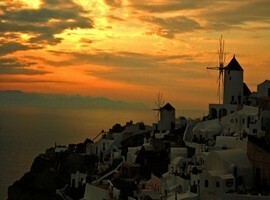 Further north, about 10 km, is the village of Oia. 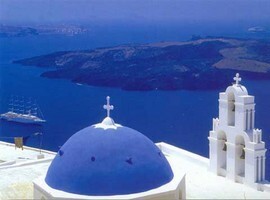 There are sandy beaches with black sand and hotels with great views of the caldera, Fira, Oia, Fira and Imerovigli. The volcanic islands of Palea and Nea Kameni, remind us that the volcano is still alive below the blue and tranquil waters of the Aegean. The excavations at Akrotiri revealed a prehistoric city from the Minoan era, buried by the massive eruption of Santorini 3,500 years ago. 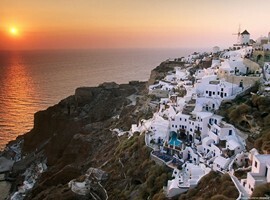 Thousands of tourists, Greeks and foreigners, newlyweds, celebrities, visit the island each summer for an unforgettable vacation, pictures of Santorini overlooking the sunset is a registered trademark of the island. 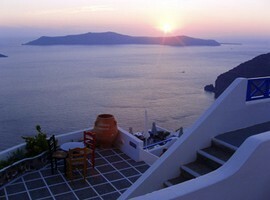 One of the most famous products of Santorini is local wines. Almost every guided excursion includes a visit to a winery. 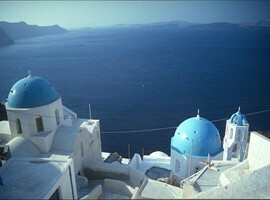 One of the most important places to visit on your vacation is the Cape (Akrotiri). 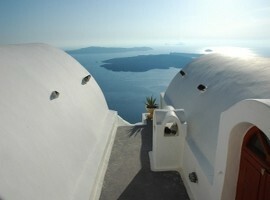 Akrotiri is probably one of the main reasons why the tourism industry developed so much on the island. This is because of the archaeological discoveries that many believe is the lost city of Atlantis. Archaeologists continue to slowly bring to light the ruins of an ancient city that had a very high level of culture. Other tourist resorts of the island is the beach resorts of Perissa Koumari and to the east, northeast Vourvoulos villages of Fira, Emporio, 12 km southeast of the city, and Milos, with beautiful Cycladic architecture and neoclassical mansions. 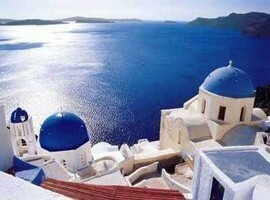 One thing you should know before visiting the island of Santorini is that it is one of the most expensive islands in Greece and your stay can be a problem in high season if you have not pre-booked. Therefore, good advice is to plan well ahead of your arrival.